Radicchio (a.k.a. Italian chicory) is a leafy vegetable similar to cabbage that has red leaves and white stems/veins. The taste is spicy and bitter but is milder when it is grilled or roasted. The most well known variety is radicchio di Chioggia, that is a deep red, round package of vegetable, with size similar to that of a grapefruit. Radicchio is rich in vitamins C, E and K, and the B vitamins such as thiamine (B1), riboflavin (B2), niacin (B3), pantothenic acid (B5), B6, folate (B9). It contains minerals such as calcium, iron, magnesium, manganese, phosphorus, potassium, sodium and zinc. Anti-microbial: The anti-microbial properties in radicchio makes it a very beneficial food for improving colon health that is the body’s first line of defence in immunity-building. Blood sugar: Radicchio contains a substance known as inulin, which may help balance blood sugar levels in the body, also reducing the risks of cardiovascular diseases like stroke and heart attack. It also motivates the discharge of pancreatic juices that helps digestion and controls blood glucose levels. Bone health: Fresh raw radicchio is a great source of vitamin K that plays a role in strengthening bone health and supports bone formation. Brain health: The high content of vitamin K that raw radicchio contains may help limit neuronal damages in the brain. Adding radicchio to your diet may help improve brain health and prevent rapid deterioration in individuals suffering from Alzheimer’s Disease. Blood Pressure: Radicchio promotes the production of bile which helps reduce cholesterol and benefits the heart health. The color of radicchio comes from the phytonutrients such as lycopene, Ellagic acid and quercitin. These phytonutrients help regulate the blood pressure and reduce Low Density Lipoprotein (LDL) that is responsible for certain types of cancers. Digestive health: The inulin and polysaccharides in radicchio help encourage the growth of beneficial gut bacteria such as Lactobacilli and Bifidobacteria, and stops the growth of the harmful bacteria that can cause harm. A healthy digestive health ensures improved digestion and regular bowel movements that means an overall wellbeing. Detoxify liver: Radicchio helps stimulate the production and excretion of bile which helps maintain a healthy liver. This makes it an excellent food to be included in your diet for regular liver cleansing for an overall good health. Digestive system: Radicchio helps encourage digestion and colon cleansing because of the high fiber content and various anti-microbial properties. It can also be used to ward off intestinal worms and parasites. Vision health: The radicchio leaves are a great source of phenolic flavonoid antioxidants such as zeaxanthin and lutein. Zeaxanthin is a type of flavonoid carotenoid which focuses on the retina health. Zeaxanthin and lutein together help guard eyes from age-related macular disease because it filters out damaging ultra-violet rays. High contents of riboflavin in radicchio are also crucial for normal vision and prevent the development of cataracts. Sedative and analgesic: The bitterness in radicchio is a property called lactucopicrin (intybin). This has a strong anti-malarial agent as well as the ability to be a natural pain reliever. Weight loss: Radicchio encourages weight loss because the high fiber content makes you feel full quicker and longer. It is rich in antioxidants that boost health, wellness and energy. Radicchio assists in body metabolism which refers to how fast the body converts food from one form to another. It also has a natural pain killer called intybin that may be responsible for reducing hunger pains. 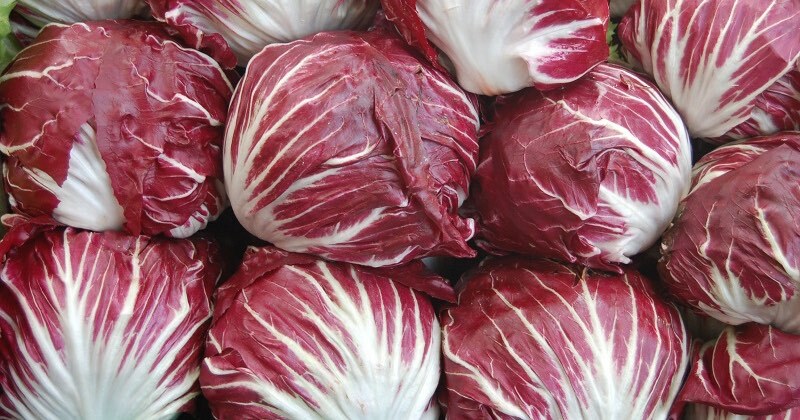 When you are shopping for radicchio, choose fresh, solid, deep red-colored heads that have outstanding mid-ribs. Make sure there are no cracks, spots or bruises on the leaves. When preparing radicchio, trim the outer leaves as you would with a cabbage. Wash it in cool water then cut into quarters and use for cooking. Radicchio leaves can be eaten raw in salads, slightly stewed, or juiced with other fruits and vegetables. The root can be created into a substitute for coffee but the plant does not have any caffeine. Radicchio can be stored in the refrigerator for up to about 2-3 weeks. Radicchio plants can cause irritation if you have sensitive skin or an allergy to daisy plants. Radicchio taken in large amounts during pregnancy is unsafe due to its ability to start menstruation or cause miscarriages. Breastfeeding mothers should use caution when consuming radicchio because there is not enough evidence that it is safe.